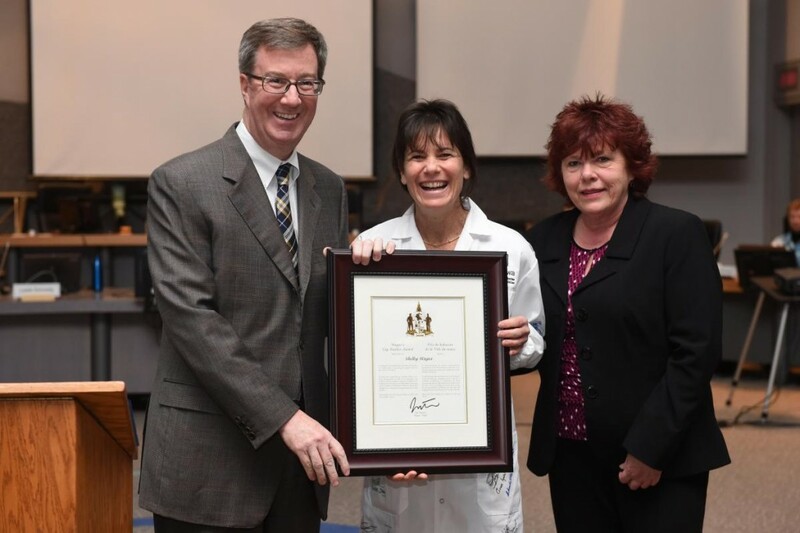 Mayor Jim Watson and Councillor Jan Harder presented the Mayor’s City Builder Award to Mrs. Shelby Hayter today for her outstanding contributions to public health as a spokesperson, fundraiser and program founder for the Parkinson’s Society of Ottawa. A lifelong natural athlete, she was training for the Boston Marathon in early 2005 when she was diagnosed with early onset Parkinson’s disease. She was 40 and the mother of three children ages 11, 8 and 6. Determined not to let the disease to slow her down, she decided to continue to train and to run the Marathon with her sister Andrea. She saw a unique opportunity to become a spokesperson for people living with Parkinson’s, and to use her marathon run to raise funds for Parkinson’s research. After her run in Boston raised $33,000 for the Parkinson’s Research Consortium at the University of Ottawa, she approached the Parkinson’s Society of Ottawa with a plan to create a program for elementary and junior high students, called Pass the Baton. The organization enthusiastically supported her plan. This unique educational program teaches schoolchildren what it means to live with Parkinson’s and inspires them to create fundraising events for Parkinson’s research. To date, through Pass the Baton, Shelby has made more than 65 school visits; she has become a role model to more than 34,000 students and hundreds of staff; and she has raised over $80,000 for the Parkinson’s Research Consortium. She says her goal is to help find the cure so her children, now teenagers, and other children of their generation will never have to deal with Parkinson’s.